After an assurance from chief minister Devendra Fadnavis, beach clean-up crusader Adv Afroz Shah on Thursday said that the beach cleaning initiative would continue from Saturday onwards. 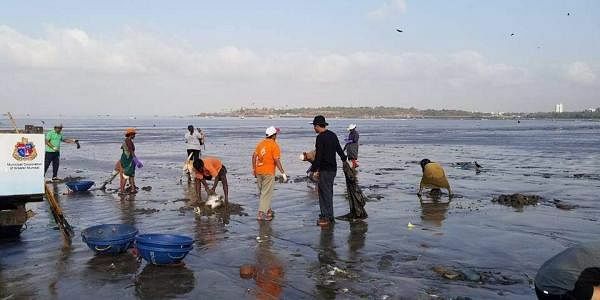 MUMBAI: After an assurance from chief minister Devendra Fadnavis, beach clean-up crusader Adv Afroz Shah on Thursday said that the beach cleaning initiative would continue from Saturday onwards. “For us, the voluntary work undertaken by Shah and the resident’s association to clean up the Versova Beach is an important part of Prime Minister Narendra Modi’s Swachh Bharat Abhiyan and we shall be with them if anyone is trying to obstruct it,” Fadnavis said after Shah met him at the Sahyadri State guest House. Some local goons and drunkards were harassing shah and the volunteers cleaning the beach. Shah apprised the CM of the ground situation that led him to shun the work last week. Fadnavis then assured him and the delegation of Versova residents that the BrihanMumbai Municipal Corporation (BMC) would be directed to clean up the garbage collected by the volunteers immediately and the government would always be with the citizen over such noble cause. Shah then said that the citizen’s initiative, which continued for the past 109 weeks, would resume from Saturday onwards. Shah and the volunteers had taken up the beach cleaning over two years ago and cleaned up the 2.7 km stretch of over 50,000 tonnes of garbage until now. The biggest ever citizens’ initiative had received praise from the UN and PM Modi. The project is an inspiration for citizens’ initiative and several activists had appealed Shah not to shun it due to some troublemakers.